Here is a meal to make when you want a something quickly without too many dishes to wash afterwards. This recipe contains ground linseed/flaxseed which is a great natural source of omega-3, especially if you don't eat fish. 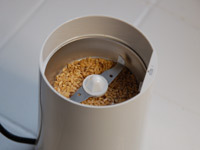 Place the linseed/flaxseed in a coffee grinder (I use the Braun KM2) and pulse the seeds until they are loosely ground. Ground linseed/flaxseed is a great ingredient to add to all sorts of cooking as it will lower the GI of a meal and will add omega-3. 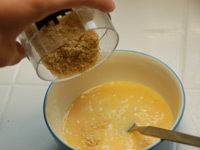 Whisk the eggs in a bowl using a fork then add the milk, ground linseed/flaxseed, spices, herbs, salt and pepper. Continue to whisk all the ingredients until they are all mixed in. 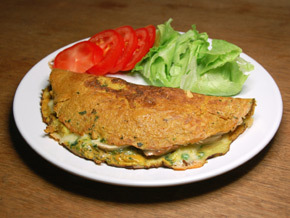 Use a good non-stick pan to fry the omelette so that you only need a small amount of oil. Add the mixture to the pan and 30 seconds later, whilst the mixture is still runny, add the frozen spinach. 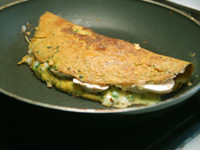 Use a spatula to ensure the omelette remains loose from the pan at the edges. 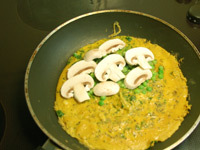 Add the frozen peas and sliced mushrooms to the same side of the omelete as the spinach. When the omelette is nearly cooked through but still moist sprinkle the cheese over the mushrooms and fold the empty side of the omelette over the cheese. Cook for another minute and serve with a small salad.